What Are the Best Tips for Doing Aerobics for Men? Find exercises that are enjoyable, such as trail running instead of running on a treadmill. Aerobics for men do not necessarily differ that significantly than aerobics for women, but the intensity, order of the workout, and specific exercises completed can vary to meet a man's specific goals. It is therefore important for the man to define his fitness goals before taking part in any aerobics for men. Aerobic exercises are designed to strengthen the heart and lungs, which means the exercises can be rigorous; if the man is just starting out, he should start with easier exercises or shorter sessions until his body adjusts to this new strain. Find exercises that are rigorous but also enjoyable. Some aerobics for men can be quite difficult and should be reserved for experienced exercisers only, but others can be done at any level. Try swimming, running, cycling, or even cross country skiing to find the activities that are most suitable to a particular set of tastes. If the man doing the exercises is not comfortable working out indoors in a gym, try to find aerobics for men that can be done outside. 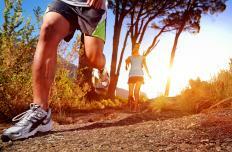 Trail running, for example, can be done year-round in many areas without having to be limited to the confines of a gym. Start out slow but work up to the next level quickly. It is important to do aerobics for men consistently; avoid long gaps of inactivity stretching several days or weeks. Rest days are certainly important, but it is even more important to design a schedule and stick to it. Too much rest lets the body regress in fitness level, while too little rest will prevent the body from recovering adequately between workouts. A two days on, one day off routine is a good start for beginners and intermediates; advanced exercisers may want to come up with a more aggressive schedule. The aerobic exercise routines should be combined with other healthy habits in order to get the most benefits from them. A healthy diet is a crucial part of any exercise routine, and the man doing the exercises should stay hydrated before, during, and after exercising. Getting plenty of sleep at night is also a crucial step in taking advantage of the benefits of aerobic exercises. Of course, if at any point the man feels pain during exercising or after an exercise session, the activity should be stopped. It is best to consult a doctor to get clearance for a particular exercise routine, especially if that routine is done concurrently with an altered diet. How do I Choose the Best Aerobics Clothes? What Is Aerobic Weight Training? What are Water Aerobics Shoes? What is an Aerobics Gym?